This page shows you how to type Consonants and Conjuncts (Half letters) using Gujarati Unicode fonts. The simplest characters are the consonants. On the Gujarati Phonetic keyboard layout, the Gujarati (or Hindi) equivalents correspond to the phonetic English counterpart as best as possible. Hence, to type 'પ' or 'प', you type 'p'. To type 'ષ' or 'ष', you type 'P'. To type 'ક' or 'क', 'ખ' or 'ख', 'વ' or 'व', 'દ' or 'द' and 'ડ' or 'ड'; you type 'k', 'K', 'v', 'd', and 'D', respenctively. 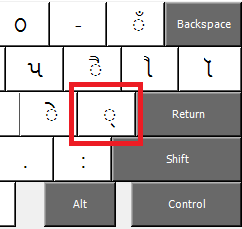 The consonants on the Gujarati Phonetic keyboard layout are mapped in the two images below. To use this phonetic layout, you must install the Gujarati Phonetic keyboard layout found here. The three image above include all the consonants of the Gujarati language plus other characters which will be explained later. To form conjuncts, such as 'શ્ચ' or 'श्च' (sch), you simply type the two consonants that form the conjunct with a virama (્) in between. If the conjunct is 3 or more consonants, then include a virama between each consonant. The virama key is the single apostrophe key ('). Hence, typing S + ' + c = શ + ્ + ચ = શ્ચ. (Note, do not type the plus (+) sign in between the consonants but simply type the keys sequentially without plus.) To type 'ત્મ્ય' or 'त्म्य', type ત + ્ + મ + ્ + ય = ત્મ્ય. The virama key is shown in the image below. When combining two consonants, usually the first consonant is a half-form and second is a whole, such as મ્ભ. However, in some cases the conjunct is represented by a single character. The table below shows some common conjuncts represented by single characters with their consonant components. The following frequently used conjuncts are mapped to the regular keyboard; hence, you can type them with a single keystroke. Conjuncts with ર are special in that ર doesn't have a half-form like other consonants. For example, the half-form of મ is મ્‍ . However, the same rules apply for conjuncts with ર. So, to type ર્ય, type ર + ્ + ય, and you will get ર્ય automatically. Similarly, typing પ + ્ + ર will yield પ્ર automatically. Unicode scripting automatically converts what you type to the correct conjunct form. Although conjuncts with દ work the same way as others, you may desire to see the virama for conjuncts with દ. For example, if you type સ + દ + ્ + ગ + ુ + ર + ુ, you get સદ્ગુરુ. The દ્ગ character is the conjunct of દ and ગ. However, if you prefer to see the virama, type સ + દ + ્ + ZWNJ + ગ + ુ + ર + ુ, where ZWNJ is the zero width non-joiner. This key is Ctrl+Alt+>. It prevents દ and ગ from joining and you will get સદ્‌ગુરુ. Other conjuncts of દ are દ્ધ (દ + ધ), દ્વ (દ + વ), દ્ભ (દ + ભ), દ્ઘ (દ + ઘ), દ્ન (દ + ન), etc. that you may or may not want joined. As a matter of fact, any time you want to see the virama without have it joined, you can type the ZWNJ in between. So, typing પ + ્ + ZWNJ + પ will give પ્‌પ instead of પ્પ.